I'm so tired today! We left the house to go shopping at 10am and didn't get back until 7.30pm! I got a couple of sleeveless skater dresses in the sale at Topshop and a skirt from there too which will look PERFECT with the wedges I got yesterday! 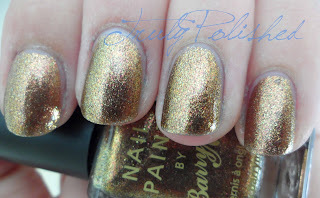 Anyway, I have another Barry M polish to show you today. This one is called Copper and it's a glass fleck polish with copper and gold particles. I love glass fleck polishes, there aren't enough of them around! I saw this on Instagram and knew I had to have it, so I bought it and put it on when I was tired of wearing Deborah Lippmann Lady Sings the Blues. The application on this wasn't as good as I expected... It was really sheer and took three coats to reach full opacity. I planned on wearing this for a few days so I added a coat of Seche Vite. This looked so pretty in the sun because you could really tell the difference between the two particle colours. It was just what I needed after the chunky glitter and navy blue of Lady Sings the Blues. I got this at my local Superdrug for £2.99 but as always, you can get it in selected Boots and Superdrug stores as well as online.